Here we are at the very end of July, and I have suddenly realized that Amber's traditional start date of the new school year is approximately August 1st. For those of you without a calendar nearby that is Wednesday. It is currently Saturday. Hmm. Let me say this flat out: we are not ready. We have all the curriculum, excepting for the economics that may or may not take the place of psychology. We have all the school supplies. What we don't have is time. 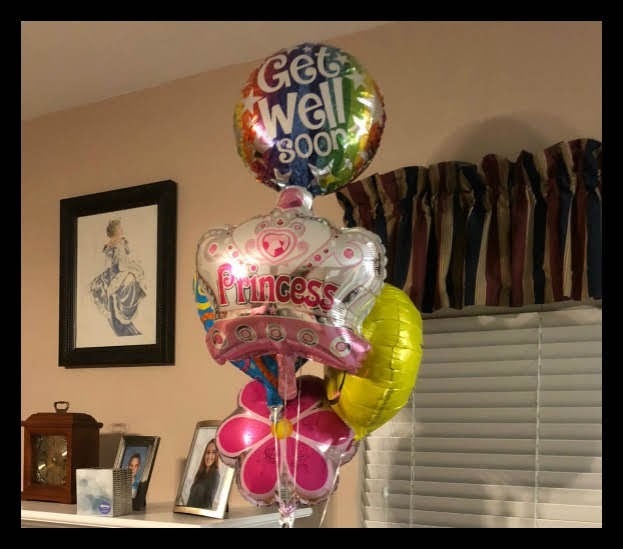 Balloons for Amber from a wonderful friend. It brightened her day. Amber's oral surgery on Wednesday, the 25th, went fairly well. The surgeon keeps saying, "She did perfect." And she did. The four teeth were also in his words, "humdingers." This is coming from an MD specialist. However, he did a fantastic job of researching her dysautonomia and EDS, and knew exactly how to best mitigate flares from either condition. So far, so good. Honestly, I don't think she's having a dysautonomia / POTS crash. Unfortunately, she did have some trouble with one site not wanting to clot properly. It set her recovery back about 36 hours. Regardless, she isn't as swollen today as she was yesterday, and yesterday wasn't as bad as Thursday. Thankfully, she's doing well. Fortnite - the day after surgery. 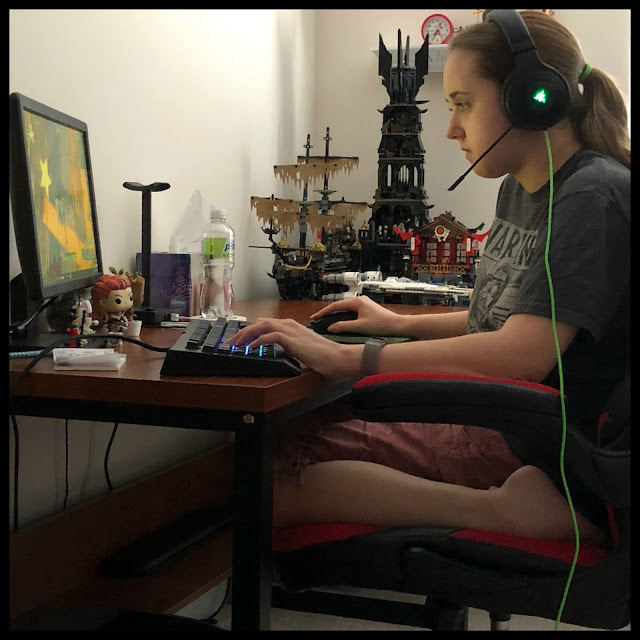 She didn't do much, but managed to game with friends. Still, I'm not sure she will be ready for school to start on Wednesday, considering she still has a surgical followup on Thursday. I know that I'm not ready for school to start on Wednesday. I have too many incomplete items on my household list to put my full attention toward school. I think I really just need like one more week. Finish painting Amber's room (no, it's not even been touched again yet), finish dealing with the new table and chairs (yes they are finally all here, one is still wobbly and a tech is coming to check it), finish licensing Fred's Tesla (ugh... DMV), talk with the electrician to schedule the charging outlet for Fred's Tesla, and continue to help Amber through her recovery. 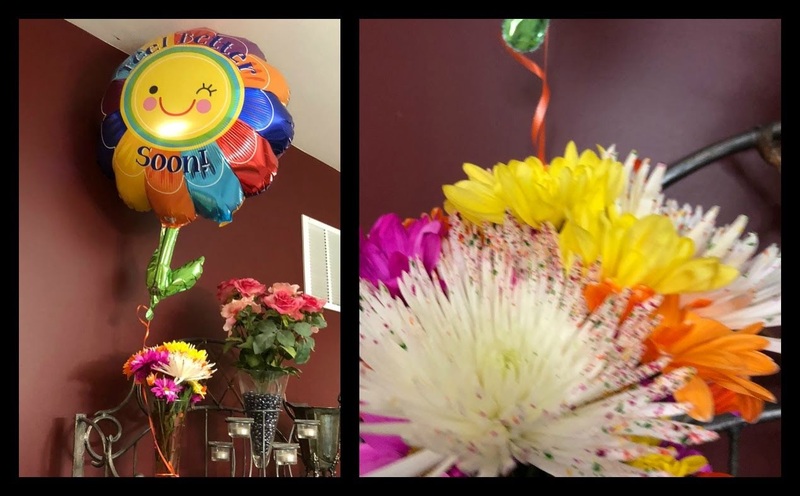 Surprise flowers and balloon for Amber from her dear friends. They helped to make her day when she was feeling low. Given the above and that even if I ignored my own to-do list, we are not mentally prepared for the school year, we are officially going to start school on August 7th. Yes. I'm sure we can manage that. We may actually take a field trip the first or second day of school, but it still will be the official start of 11th grade for Amber. Here's to one more week of summer break, and may we make the best of it!